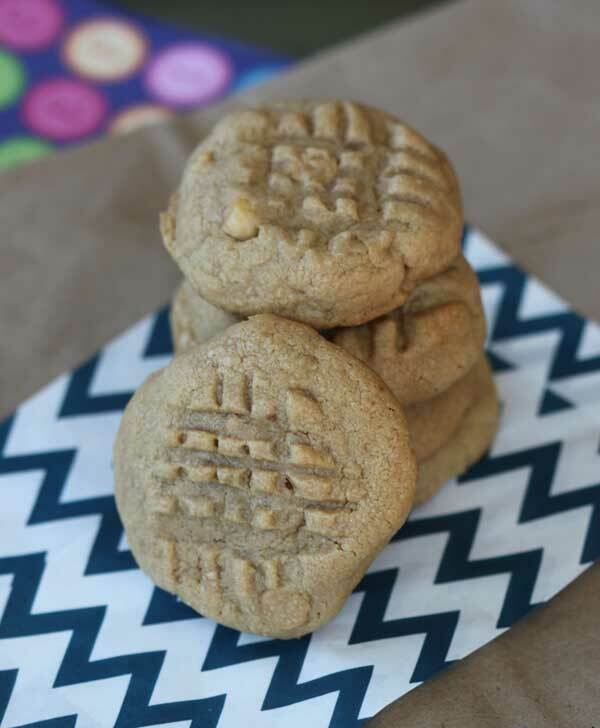 King Arthur’s Triple Play Peanut Butter Cookies are high on my peanut butter cookie list. They are big, fat, full of peanut & peanut butter morsel chunks, and soft. I make these all the time. Sometimes I add Reese’s Pieces for more colorful cookies, and sometimes I just use peanut butter chips. The peanut butter chips are pretty important, so if you don’t have any you might want to try a different recipe. Triple Play Peanut Butter Cookies (Adapted from KA Cookie Companion) is one of my all-time favorite peanut butter cookie recipes. The volume measurements are fine, but for best results use the weights. Preheat oven to 350°. Line baking sheets with parchment. Beat butter, sugars, peanut butter, baking powder, baking soda, and salt together with an electric mixer.. Add eggs one at a time. Stir in the flour, nuts, and chips. Drop by generously tablespoon onto prepared sheets (or follow method in notes). Bake for 12-14 minutes, until set and brown around the edges. Remove from oven and cool on pan 5 minutes before transferring to wire racks to cool. For thicker cookies, prepare the dough as directed, but shape the dough into 36 balls, put the dough on foil lined plates or a tray that can fit in the refrigerator. Chill the dough for several hours. When the dough balls are firm, arrange dough balls a few inches apart on parchment or foil lined baking sheets and bake for 14 minutes or until fully baked. These totally hit the spot! I was badly craving PB cookies, but only had whole wheat bread flour (2 babies napping so I was stuck at home with what I had). I think the whole wheat gives them a unique heartiness. Super-yummy! I finally made these – and they’re fabulous. I didn’t make any changes, but I just wanted to add to the reviews – these are completely worth making if you like peanut butter cookies and want more peanut-buttery goodness than in your normal cross-hatch PB cookie. Thanks for the recipe! These cookies were amazing! 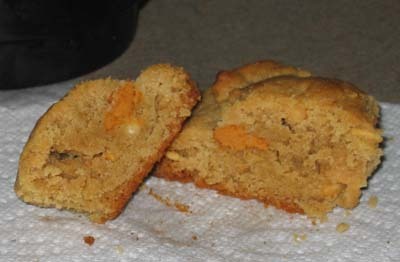 I made them as big cookies (1/4 c. scoop) and they baked up fat and soft. I froze several and have been pulling them out every now and then to have after lunch or for an afternoon snack! Delicious! These cookies were awesome… my coworkers gobbled ’em up. I made some with M&Ms tucked stuck in the top, which made them both prettier and tastier than the ones without. Hmmmmmm. Those cookies are usually pretty peanutty. However, I’ve always made them with the peanut chips. I love the combination of peanut butter and chocolate, but maybe this was a case where the chocolate took away from the peanut butter. If you find a peanut butter recipe you like better, let me know. I just tried these…and well, they didn’t really taste very peanutty to me at all! Everyone else really liked them and could taste the peanuts. I will mention that I only put chocolate chips in–I didn’t put in peanut butter chips. Was that were I went wrong?? this is my new favorite peanut butter cookie. when i saw your picture, i had to make them. the texture is incredible. i put in mini chocolate chips because i love chocolate w/ peanut butter. I have been craving peanut butter cookies for a while now. I think this entry is a sign that I should make some.